Murder by Gaslight: A Woman Scorned. William Goodrich paid a visit to the lodging of his brother Charles, on Degraw Street in Brooklyn, on March 21, 1873. Getting no response at the door William entered the house to search for his brother, and found Charles lying dead on the basement floor, neatly posed, as if laid out by an undertaker. Charles had been shot in the head, and lying on the floor near his hand lay a revolver, suggesting suicide. But William Goodrich knew his brother too well to believe this. The Brooklyn police quickly came to the same conclusion as William Goodrich, suicide was impossible. Charles Goodrich had been shot three times in the head, and after his death, someone had washed the blood from his face and combed his hair. Under his head was a pillow made from a piece of damp cloth over a pair of boots. Three damp towels had been found hanging in the basement, one stained with blood. Whoever had cleaned him, then put a clean shirt on the body and posed it in the position William Goodrich had found. Goodrich’s watch was gone and all of his cash was missing, giving the impression that he was murdered by burglars but, because of the way the body had been cleaned and posed, the police believed the killer was a woman. There were other reasons to suspect a woman. Charles Goodrich, who was forty-one years old at the time of his death, was a widower, living in a Manhattan boarding house. He and his brother William owned a block of houses on Degraw Street that were under construction. In the spring of 1872, Charles “rigged up” a room in one of the houses, where he could sleep when there to supervise the building. His absences from the boarding house became increasingly frequent and during the summer his Degraw Street neighbors would see him sitting on the stoop of his building with an attractive young woman. By autumn she was no longer seen in public, but neighbors would often see her leaving the house very early in the morning. A second woman had also been seen at Goodrich’s house that winter and she was soon identified as Miss Adeline Pabor, the fiancé of Charles Goodrich. A letter was found in the house which explained the motive of the murder and made the still unidentified first woman the prime suspect. The letter, addressed to Charles Goodrich’s father, said that the writer of the letter believed herself to be married to Charles, and had even had a child with him, but he had recently told her that the marriage had been a fraud and he was throwing her out to marry another. The letter was signed, Amy G.
The Goodrich family offered a reward for the capture of the mystery woman, and the police received information that she was known as Kate Stoddard and she had worked as a straw hat maker. Her real name was Lizzie King, and she was from Plymouth, Massachusetts. Prior to coming to New York, she had been an inmate at an insane asylum in Taunton, Massachusetts, from which she had escaped. The police now had a description: she was a pale, good-looking woman, about twenty-three years of age, of medium height and graceful figure. But beyond that, they had no leads; Kate Stoddard could be anywhere. 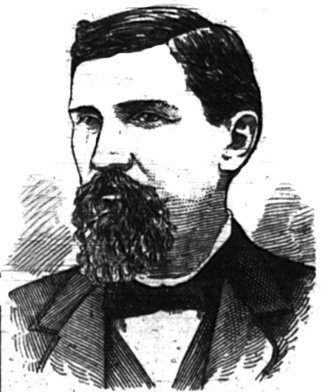 The Brooklyn Chief of Police in 1873 was Patrick Campbell who had not come up through the ranks of the Brooklyn Police Department. He began work in the printing office of the Brooklyn Eagle newspaper and after rising to position of supervisor he turned to politics. Chief of Police was the latest in an advantageous series of political appointments. His lack of police experience turned out to be an advantage, allowing him the freedom to try creative solutions not always in endorsed by those under his command. A woman named Mary Handley volunteered information that she had, at one time, been a roommate of Kate Stoddard’s in Brooklyn. After a lengthy interview Chief Campbell hired Mary Handley as a detective, reporting directly to him. He sent her to follow leads as they arrived from towns in upstate New York. The search for Kate Stoddard continued for several months without success. During this time several other suspects were considered and other theories floated regarding the murder. 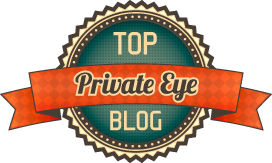 Suspects included an Englishman named Barnet or Barrett, James (alias “Pop”) Tighe and two other burglars, and a “dark-visaged Spaniard” named Roscoe. A Lucette Meyers who was known to have been “intimate” with Charles Goodrich claimed that Roscoe killed Goodrich out of jealousy. The press took an interest in Roscoe as a suspect, but the police dismissed him a figment of Lucette Meyer’s imagination. In any case, the mysterious Roscoe was as elusive as Kate Stoddard. “That I’m sure I won’t do,” said the woman in custody. The woman wore a large gold locket on a chain around her neck which she would not hand over. It was taken from her and the chief, with some difficulty, forced it open. When it opened, some dark colored crumbs or lumps, fell onto the floor. The woman quickly picked them up and put them into her mouth. Fearing that she might have taken poison, the chief grabbed her arm and asked her what it was. “That’s blood—dried blood.” She said, but would say no more. She was held for several days but refused to talk. Then Campbell made another bold move; he had his men knock on every door in Brooklyn and inquire if any of the households had been missing a young woman since the previous Tuesday. Within two hours they had 300 names; by the end of the day they had narrowed the search to the house they were looking for. A boarding house on High Street was missing a woman named Minnie Waltham who was a hat maker. A latch-key found on Kate Stoddard fit the lock on the missing girl’s room. In her room they found Charles Goodrich’s watch and other personal items along with a revolver with three empty chambers. His money was there too; none had been spent. There was now no doubt that the woman in custody was Kate Stoddard. Before the coroner’s inquest, Kate Stoddard, allegedly, had confessed to the murder of Charles Goodrich. They had met through a personal advertisement that Goodrich had placed in the newspaper, looking for a wife. Upon meeting, each was impressed by the other, and after a brief courtship, a marriage ceremony was held. Kate Stoddard lived in the room on Degraw Street until the spring of 1873. During that time, Kate had become pregnant, and Goodrich persuaded her to have an abortion. Goodrich had apparently been seeing Adeline Pabor at the same time and decided that she was the one he wished to keep. After he became engaged to Miss Pabor, Charles told Kate that their marriage was a sham, the ceremony performed by a friend of his. They argued and she begged him to take her back, but he was unyielding. The next day she found that all of her belongings had been moved to an unfinished room in one of his buildings in Degraw Street. She went to see him the next day, and during an argument she drew a pistol and shot him. Kate left, but returned later to clean and dress the body. She had saved some of the dried blood from the body inside of the locket Chief Campbell had opened. During the frantic police search, Kate Stoddard had never left Brooklyn and had even attended the funeral of Charles Goodrich. At the inquest, Lucette Meyers identified the articles found in Kate Stoddard’s trunk. She said she knew the defendant under several names: Kate Stoddard, Amy Snow, or Stone, and as Amy Gilmore. Meyers was still accusing Roscoe of the murder, but said she saw him in conversation with Kate Stoddard. Kate Stoddard took the stand, but on advice of counsel, refused to repeat the confession she had given the police, saying she would save any statement for her trial. The coroner called on Chief Campbell to relate to the jury the confession that Miss Stoddard had given to the police. The coroner’s jury deliberated only a short time before returning with a verdict. Before Kate Stoddard could be tried for murder, a hearing was held to determine her mental competency. The hearing included testimony from doctors who had cared for her at the Taunton Lunatic Hospital stating that at time she had been put into a “camisole” (strait jacket) on account of violence or destructiveness. But that risk was not taken, and Lizzie King, alias Kate Stoddard, was never tried for murder. She spent the rest of her life in the Auburn Asylum. Even before arrest, the citizens living on Degraw Street, successfully petitioned to rename the section of Degraw Street between 5th and 6th Avenues to Lincoln Place, to disassociate the street from the negative association of the murder. Benardo, Leonard, and Jennifer Weiss. Brooklyn by Name: How the Neighborhoods, Streets, Parks, Bridges and More Got Their Names . New York: New York University Press, 2006. Bradshaw, Wesley. 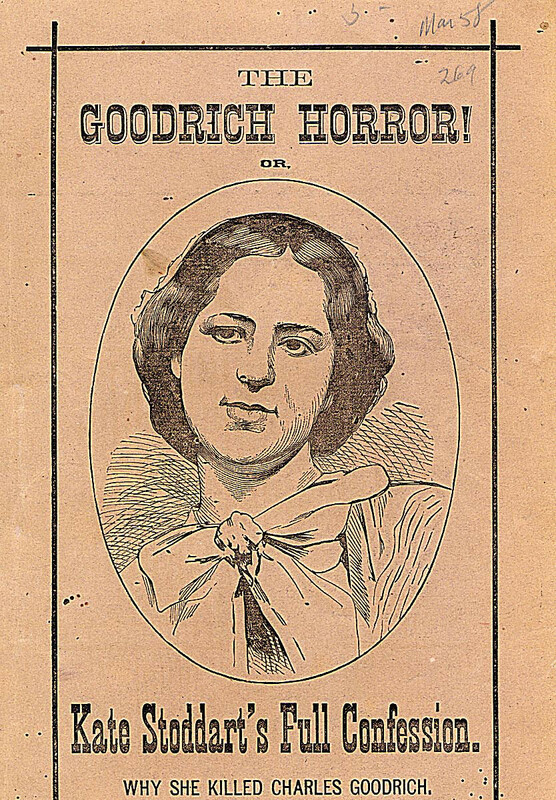 The Goodrich horror: being the full confession of Kate Stoddart, or Lizzie King : why she killed Charles Goodrich, showing a deserted woman's vengeance ... Philadelphia: Old Franklin Pub. House, 1873. Walling, George W., and A. Kaufmann. Recollections of a New York chief of police: an official record of thirty-eight years as patrolman, detective, captain, inspector, and chief of the ... of the Denver police, by A. Kaufmann. Denver: Specially issued for the benefit of the Denver Police Mutual Aid Fund, 1887. "The Goodrich Murder.The Detectives Working in the Dark" The New York Times 1 Apr. 1873. 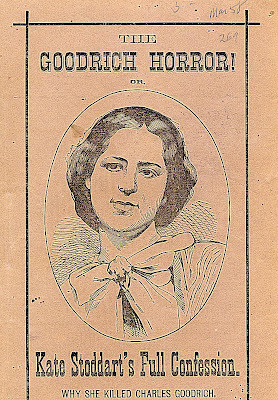 "The Goodrich Murder; Latest Details, Arrest of the supposed murderess." The New York Times 11 July 1873. "The Goodrich Murder; The Inquest.." The New York Times 13 July 1873. "Kate Stoddard Finally Disposed Of." The New York Times 16 July 1874. I think the jury's decision should say "1873" and not "1973"
I love your gaslight series.I do not write murder mysteries but fine the ones from the 1800's fascinating. Thanks for the article. My great-great-grandparents lived very near this incident, and I was researching goings-on in their neighborhood when I came across your article. Just watched the episode on Travel Channel's Mysteries At The Museum. Interesting! HANDCUFFS, WATCH & WALKING STICK . THERE IS A CHAPTER ABOUT HIM IN A BOOK CALLED "BROOKLYN'S GUARDIANS" . WHEN HIS NAME COMES UP . I hope I am not related But I think I am. Kate looks like my Aunt. My whole family were born in Akron, OH. I looked at the family tree and there was a Minnie and a Charles.